Happy Easter from Nibbles! Not an actual Easter photo. This one was taken on Friday when I tried her new dress sheet on her. I couldn’t get her ears so enjoy the tongue action. I did, however, go to the barn this morning but not for a particularly good reason. Explanation to follow. 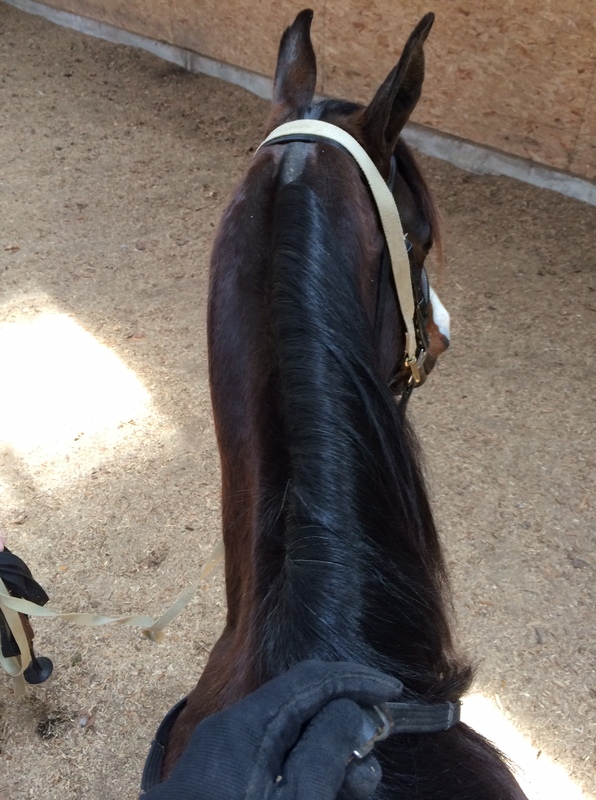 On Friday, following the first arena ride, I spent maybe 40 minutes clipping the poor beastie. I meant to just do the outside of her ears and she pulled and I slipped…and took out a chunk on the inside. So off it all came. She was not particularly thrilled about having her ears done but she really wasn’t that bad. I also did her face/nose and bridle path. After that, we tacked up and headed back to Our Tiny Indoor: hereafter, OTI. 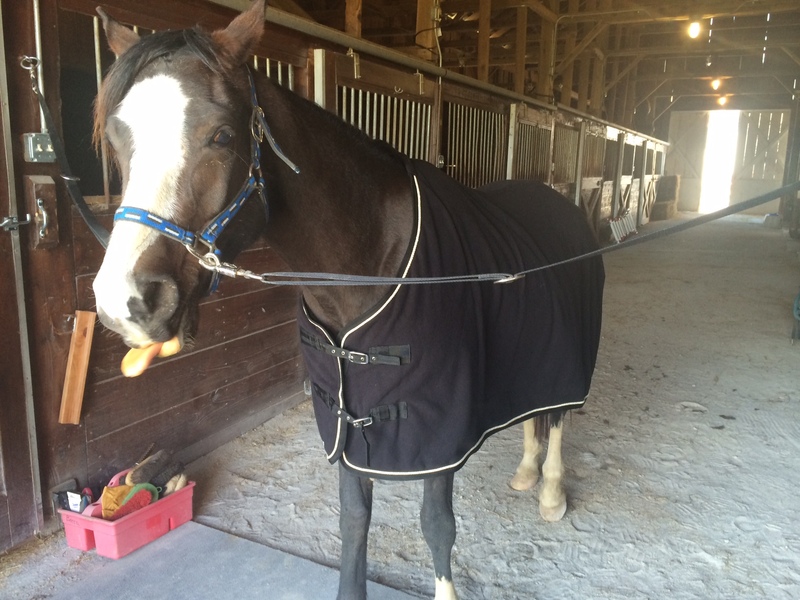 Because of how small her circles have to be in OTI, I only lunged her for maybe 5 minutes then hopped on. Leah walked next to us like the day before. Then with a little guidance from me, we sent her out on the circle while Leah stood in the center and “lunged” us. I use this term loosely because Nibbles doesn’t require much micro-management. 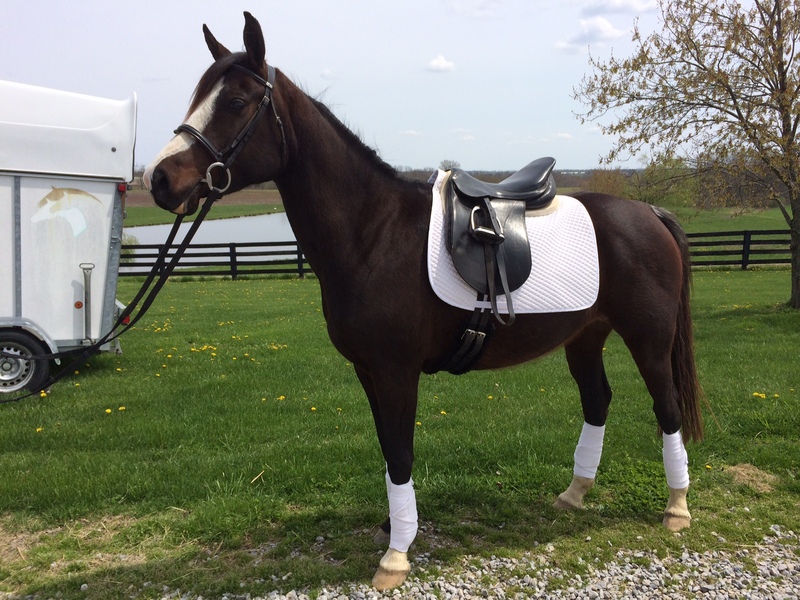 She’s a pretty forward horse naturally so when you send her out, she goes until you change something, whether it’s speed, gait or direction. She felt good at the walk so after discussing with Leah what to do if Nibbles freezes, explodes, bolts, rears, or otherwise panics, she asked her to trot. Baby’s first trot was…uneventful. Unlike many greenies I’ve been the first on, she didn’t need much encouragement to move out and after one circle, she seemed to have a relatively good feel for how to balance me (for a greenie, that is). I don’t have pictures or video because the humans were preoccupied but YAY! We got a few circles to the left, then a a few circles to the right. Asked for a couple laps then back to the walk and much praising. Very little tension, no blips – what a good girl! So we called it a day and pumped her with sugar cubes. That’s not entirely true. Her show is a week from today so we washed her mane and tail out for the first time in…6 months? I don’t do it often. Oh, and before the ride, we snapped a couple of shots. I didn’t realize my trailer was in this until after the fact. Oops! Leah and I went to the barn again yesterday with the intent of getting some new photos and video of my other mare who is for sale. Perhaps I’ll do a post on her? Anyway, the plan was to groom and give Nibs the day off. I caught her (aka grabbed her from the gate where she was waiting) and saw that the slight puffiness in her LH was now slightly more than slight puffiness. How’s that technical jargon for ya? To me, it looks like minor edema in the suspensory. I’m wondering if the circles in OTI are too small and making her sore? But then she’s only coming-6 and I’m careful to keep them to a minimum and never more than a medium trot. 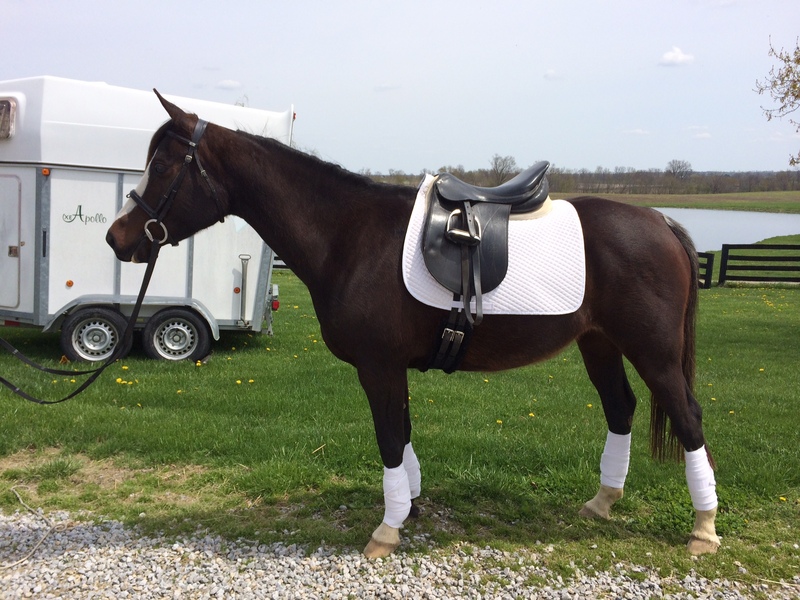 As you read in my Tack Haul, I just bought a new jar of Sore No-More so I slapped a poultice on both back legs and put standing wraps on. Nibbles isn’t off and this was the first time there was any heat whatsoever in that LH. I kept her in overnight and I went out at 5am this morning to rinse off the poultice. I don’t have before pictures (go me) but these are after the rinse. It looks pretty much the same as it did yesterday. It seems slightly tender (like yesterday) but again, she doesn’t seem off on it so I turned her back out for the day. Another boarder is checking her for me tonight. Anyone see anything that I don’t below? 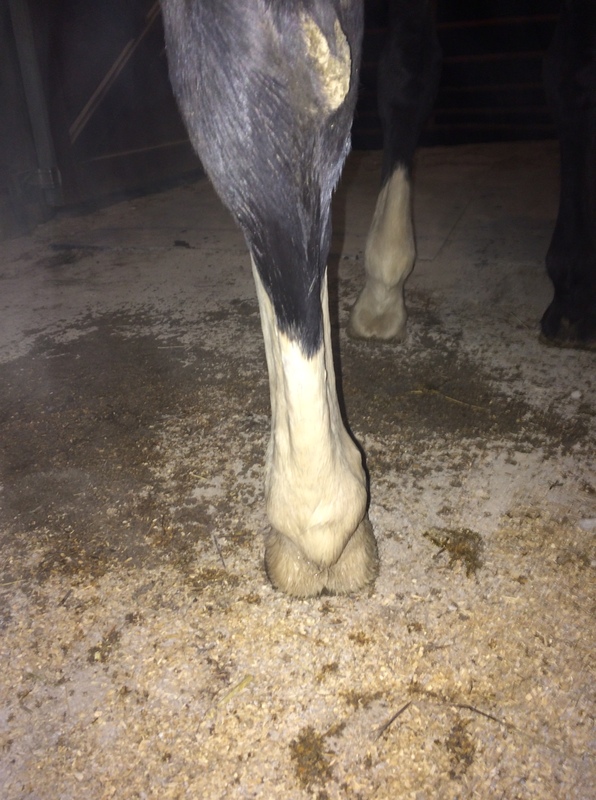 Just a little swelling on the outside above her fetlock. Hope the puffiness goes away.